Mad Hatter (aka Jervis Tetch) is a super-villain and enemy of Batman. He often works as a thief, obsessed with stealing hats to finish his collection of head-wear. Mad Hatter has a large, green top-hat with a darker green band going around the funnel. A yellow tag sticks up from under the band. In LEGO Batman it reads 10/6, but this detail was removed for LEGO Batman 2. He has, long, slanted, light brown eyebrows and buck teeth. He wears a green jacket which opens more as the torso goes downwards, first revealing the top of a white, button-up shirt, then a large, red-bow tie, and finally a vest checkered with two different shades of purple. Hatter has yellow gloves and orange legs. On the portable versions of LEGO Batman, he has short legs. 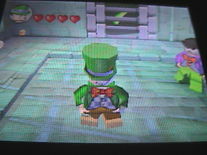 In LEGO Batman: The Videogame, the Mad Hatter is a boss and a playable character. He carries a small handgun, can double jump (due to a propeller built into his hat), and use mind control on certain targets or to open certain doors. He is unlockable for purchase after the level, The Joker's Home Turf. He also has two playable vehicles, Mad Hatter's Steamboat and Mad Hatter's Glider. Other than roam around in their respective environments, water and sky, and in the glider's case, shoot lasers, they have no abilities. In the portable version, he is able to go through chutes and drop bombs to destroy silver objects. In LEGO Batman 2: DC Super Heroes, both of these abilities are removed. He now uses just a melee attack and can jump no higher than Batman. Jervis Tetch became obsessed with the lunacy of Alice's Adventures in Wonderland and its sequel, Through the Looking Glass, especially the chapter A Mad Tea Party, to the point where he believed himself to be a reincarnation of a character known as The Mad Hatter. Jervis Tetch became a thief known as Mad Hatter to finish his collection of headgear. He is also known for his hypnotizing and kidnapping schemes. In the video game's story, The Mad Hatter was a part of The Joker's group, which also consisted of Killer Moth, The Scarecrow, and Harley Quinn. Mad Hatter traveled to the factory where The Red Hood transformed into The Joker to retrieve special chemicals for The Joker. While investigating, Batman and Robin came across and defeated The Mad Hatter. He was sent back to Arkham Asylum. 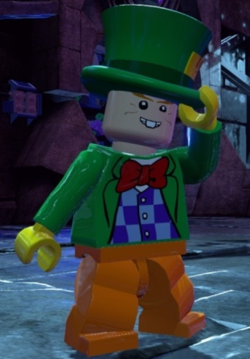 On the console versions of LEGO Batman 2: DC Super Heroes, Mad Hatter is a playable character. He doesn't play any role in the main story. Mad Hatter appears outside Gotham Theatre after Asylum breakout and can be purchased after defeating upon him for 100,000 studs. He doesn't have special abilities. On the portable version, The Mad Hatter appears as a boss in the level "Arkham Asylum". His minikit can be found on the same level by using a super-strong aquatic character such as Aquaman or Killer Croc to break the door of an underwater cell containing it. He costs 60,000 studs. This page was last edited on 26 November 2016, at 03:55.